PT PKP (Karyasindo Son Initiative) who had spent 21 years in the field of property Batam on Friday (08/01) re mengelar property expo, which will last for approximately a month. 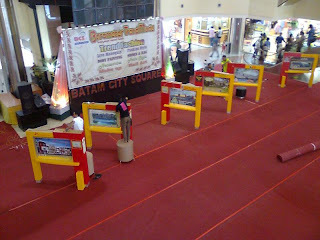 PKP Expo promotion that lasted until 02 Februari 2010 will take place in the BCS Main Atrium Mall. According to Sugiarto Thoie as event organizers that accommodate PKP expo this time, there will be 17 projects that will be displayed PKP. "There will be 17 projects to be presented by PKP for people who plan to have the residential quality of the PKP, all offered with a lightness and flexibility of payment" Sugiarto Thoie said. In the meantime, PKP Campaign Manager, Herat Gentur states, many other benefits that can be found in the exhibition PKP consumers in early 2010 this. Among other things, consumers who want to make cash purchases stages, will benefit and pay an efficient way. With the way this cash, bank interest rate risk can be avoided. "We try to provide opportunities to communities that may be in the year 2009 and have not had a desirable residential memilliki, so soon visit our exhibition in the BCS this mall, to obtain accurate information about various projects PKP" Gentur said via telephone to explain. Meanwhile on the other hand, the fact the current market share slightly shifted from the estimate of business, the need for quality housing and economic perbaikkan occur have a significant influence on the growth of property business. Cuts benchmark interest rate a consumer credit interest rates which the Bank Indonesia or BI Rate, hoist the demand for home ownership credit (KPR). Many banks are optimistic, the distribution of mortgages will grow rapidly in the first quarter of 2010. Even some banks admitted mortgage applications flooded early third quarter.